If you have more than a patch of grass, you might be looking into purchasing a riding lawn mower. There are so many options to choose from that it can be tough to decide on the one that’s best for you. If you’ve decided that you’re ready to relax while you mow the lawn, read further. We talk about the useful features of the best riding lawn mowers and review them. Get the best performance for your money and make sure that you can maneuver your machine around your yard. What Kind of Transmission Should it Have? A riding lawn mower, or tractor, doesn’t just let you get off your feet while you’re tackling this demanding chore. It also cuts up to three times faster than a push mower, according to Consumer Reports. Whereas walk-behind mowers cut a 20-inch swath, tractors typically cut a strip that’s between 42 and 48 inches wide. Some wide models can cut 54 inches in one pass. These vehicles can be much more expensive than a push mower. Spending more money doesn’t always ensure that you’ll get the highest quality product. Therefore, you need to know what you’re getting before you shell out thousands of dollars. We’ll discuss the size and other features below. Before you consider that, you need to think about your terrain. Almost any tractor, including a zero turn radius model, can be used on flat ground. Hills require a wider vehicle with a low center of gravity. If your yard slopes, you’ll also need a tractor that provides sufficient traction so that you don’t slide around when you’re trying to use it. The specs and accessories can vary greatly between mowers. If you don’t select the right option, you might increase the amount of time that you spend mowing the lawn. Before you begin your search, you need to consider the best size for your yard. Compact mowers may maneuver better in tight spaces, but they don’t always cut a wider band than a push mower does. Consider the layout of your property. An open yard can benefit from a mower with a wide deck because you can cut larger swaths all the way across the lawn. A yard that’s dotted with obstructions is better suited for a compact mower. You’ll be able to navigate the turns and spend less time doing detail work. Noise is always a factor when you’re selecting a riding lawn mower. You don’t want to irritate the neighbors or wake up your kids when you mow the lawn. This is especially true if you enjoy mowing early in the morning or late in the evening, when the sun isn’t so hot. Lawn tractors are powered by gas. They’re louder than electric push mowers. Most lawn tractors drive like a car. They use a round steering wheel, which feels natural for most people. You might want to seek out a model with a comfortable seat. A high back will let you relax and lean into it instead of holding yourself tall as you cut. Riding lawn mowers come with gear-drive, automatic or hydrostatic transmissions. The transmission sends the power from the engine to the wheels. A manual transmission is the basic option and ideal for a tight budget. You’ll have to know how to shift gears to operate this type of mower, though. Manual transmissions are incredibly durable. They’re not ideal for hilly yards or those with many obstacles. If you’ll be turning frequently, you’ll have to engage the clutch often, which can be tiring. An automatic transmission makes driving easier. These models tend to be more expensive than manual transmission mowers. You don’t have to worry about shifting gears as you drive. Some automatic-transmission mowers have a different gear for accelerating, but you don’t have to stop to shift into it as you would with a manual transmission. A mower with a hydrostatic transmission uses fluid instead of a belt-and-pulley system to transfer power from the engine to the wheels. It’s the most powerful type of transmission. It also offers the smoothest ride, making it the best option for people who have to turn or change speeds frequently. 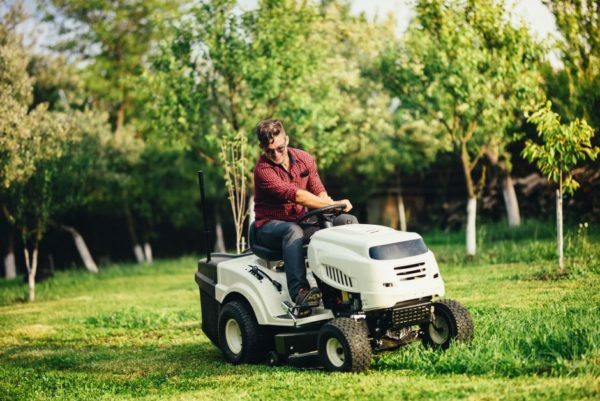 The transmission life is long, but these mowers are more expensive to buy. They can also be costly to maintain because they require more maintenance and gas. Just like your car, riding lawn mowers need regular maintenance. The instruction manual that comes with your mower should detail the specific maintenance steps that your model requires. Before performing any maintenance, disconnect the battery or spark plug wires. Inspect the shields, deflectors and blades. If any are worn or damaged, replace them. Check the tire pressure, oil level and fuel level. You’ll need to check the air cleaner system during the mowing season. During the mowing season, keep the mower spindles and pivot points lubricated. Don’t store the mower with debris on it. Brush off dirt and grass before putting the mower away. You should change the oil at least once during the growing season. Oil changes should be completed after every 50 hours of use. Whatever you’re looking for in a lawn mower, we’re here to help. Here are our top choices for the best riding lawn mowers. With a foot-pedal automatic transmission, this riding lawn mower may be easier to operate than your car. 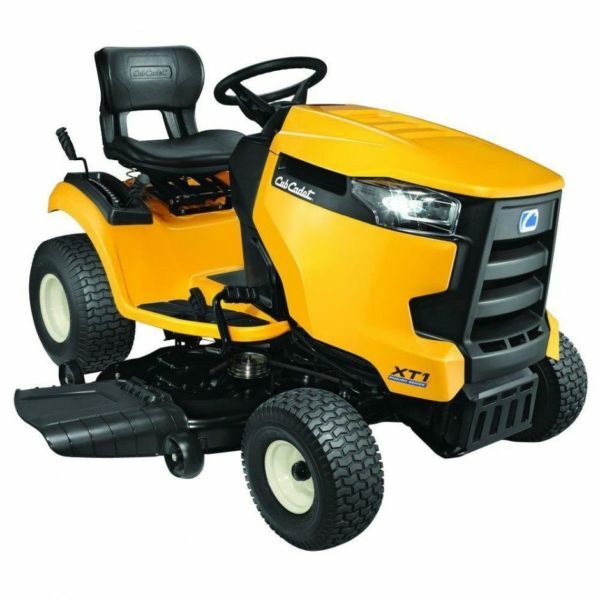 It features a 19HP/540cc Briggs & Stratton Intek single-cylinder engine, which provides plenty of power. You can mow while driving forward or backward, which will help you cut evenly around tight corners and obstructions. It’s as comfortable as it is powerful. The seat is lightly cushioned and supports the mid-back to allow you to rest while still offering you mobility. The soft-touch steering wheel feels good in your hands. Both the seat and steering wheel can be adjusted for optimum ease. The Step Thru frame allows you to enter and exit the machine quickly, making your job that much faster. The 46-inch cutting deck is an ample size. It cuts efficiently and can be hand-adjusted to five cutting height positions. It also has deck wheels to prevent scalping when you’re going over bumps or rough terrain. The wheels are 15” x 20” and sturdy enough to handle some slopes. It mows at speeds up to 5.2 mph. You can attach a number of accessories to this lawn mower, including a snow plow and garden cart. It features a side-discharge deck and has a mulching option. The mower disperses the grass evenly so that it doesn’t leave large clumps that can damage your lawn. If you’re looking for a more compact mower, this option might be for you. It’s a durable workhorse with many convenient features. 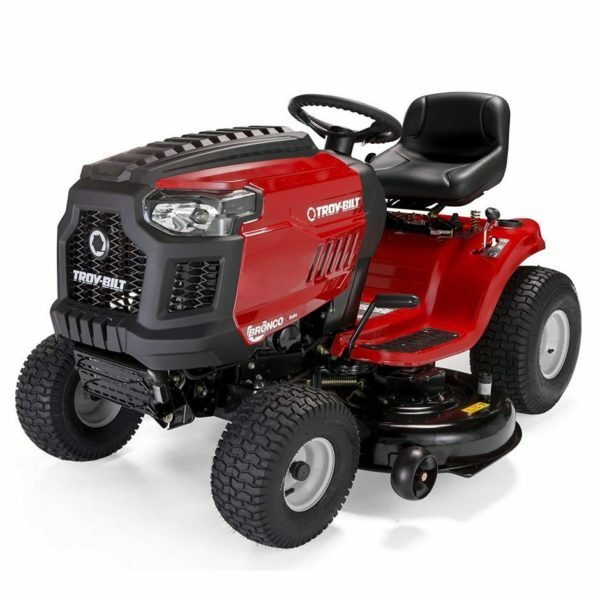 It features a Briggs & Stratton 22 HP two-cylinder engine, which is powerful enough to tackle almost any job. It is equipped with attachments for front and rear-mounted accessories to make your gardening chores easier. This riding lawn mower cuts a 42-inch swath. 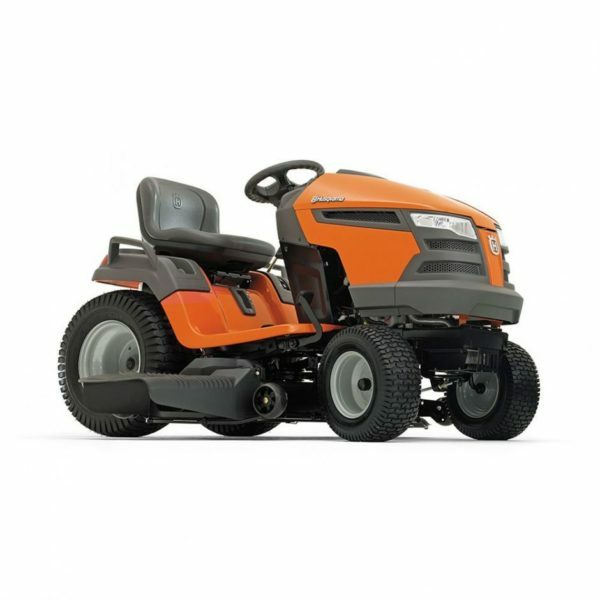 It features air induction mowing technology, which produces a more consistent cut. This is one of the smoother riding lawn mowers. It has a hydrostatic transmission for ease of use and ultimate control. It moves smoothly forward and backward. The blades are automatically disengaged when you put the vehicle in reverse unless you tell it otherwise. The blades also disengage when the operator steps off of the machine. One of the downsides of this mower is that the deck wheels are flimsy. They can bend over time from hitting bumps and rocks. The mower also has some plastic pieces, which can warp as time goes by. The 3-gallon gas tank doesn’t need to be refilled frequently. The U-cut steering technology prevents you from missing areas. The cutting deck is powder coated so that cuttings don’t stick to it. It also features a deck wash port that makes it easy for you to flush away debris. If you have a large yard that’s tough to navigate, you can make easy work of it with this vehicle. It has one of the widest cutting swaths available. It can mow a 54-inch ribbon quickly. One of the other standout features is its zero-turn radius. As long as you’re not dealing with steep hills, this will maneuver easily on any property. 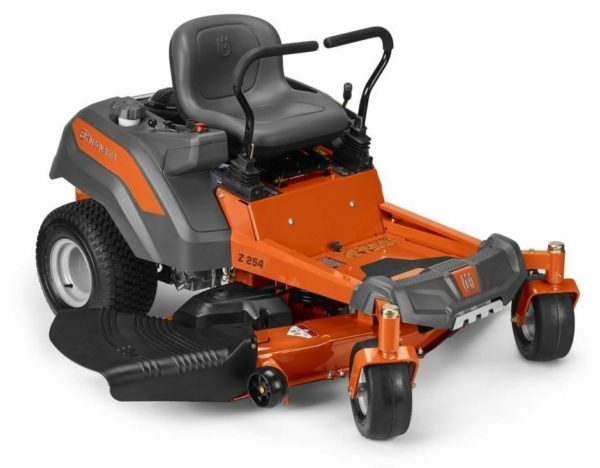 Like the other Husqvarna riding lawn mower that we reviewed, this one has a hydrostatic transmission for a smooth ride. With 26 HP, the engine is more powerful, though. It starts reliably and can hit maximum speeds of 6.5 MPH. Because it has steering levers instead of a wheel, some may find this difficult to operate. The parking brake system automatically activates or deactivates based on the operation of the levers, giving you peace of mind. If you’re planning to mow the lawn when the sun is down, you might want to purchase a headlight. The mower doesn’t come with one. There are many features that make this a great option, though. The deck has sturdy wheels to prevent scalping. The seat has a 15-inch back that offers decent support. It also has a cup holder for added convenience. Although it looks like a beast, this riding lawn mower might be the easiest one to use. It features simple engineering and many beneficial characteristics. Although it only cuts a 42-inch swath, it moves faster than a push mower. The size of the machine is considerable, but the turn radius is surprisingly tight, at 16 inches. Combined with the narrow allowance, this makes it work well for smaller yards. Like most riding lawn mowers, this one allows you to attach accessories. You don’t need any tools to use the QuickAttach system, though, making it extremely convenient. Unfortunately, this model doesn’t accommodate as many accessories as the larger lawn mower from the same manufacturer. However, that might be our only complaint. Driving this piece of equipment might almost be as fun as maneuvering a sports car. It also has several features that help it last a long time. It is made of quality materials, has a corrosion-resistant e-coating defense system and features an advanced deck wash system. It’s already built to last, and the warranty supports its durability. This lawn mower comes with a 3-year warranty that covers the powertrain. A 5-year warranty includes the front axle and chassis. The shell deck comes with a limited lifetime warranty. The most expensive lawn mower on our list is also the one that cuts the widest swath. This monster shaves 60 inches of grass at once, which can help you maintain a large yard. With a 24 HP motor, it has plenty of power. It’s also surprisingly easy to use. It was designed to be larger and more durable than its predecessor, and it doesn’t disappoint. The deck is made of high-gauge steel. You can adjust it easily using a dial. This lawn mower is speedy. It reaches 7 mph forward and 3 mph when it’s moving backward. Considering its size, it’s extremely agile. It has a zero turn radius. When it comes to comfort, the seat is plush and has a high back. It’s almost as relaxing as your sofa. One of the biggest disadvantages of this mower is that it has a large footprint. You might have to make some concessions to accommodate it in a garage or shed. But this might be the best mower to get for a sloped lawn because it’s so wide, and you can maneuver it around obstacles with ease. It was hard to pick the best lawn mower because they are all suited for different needs. 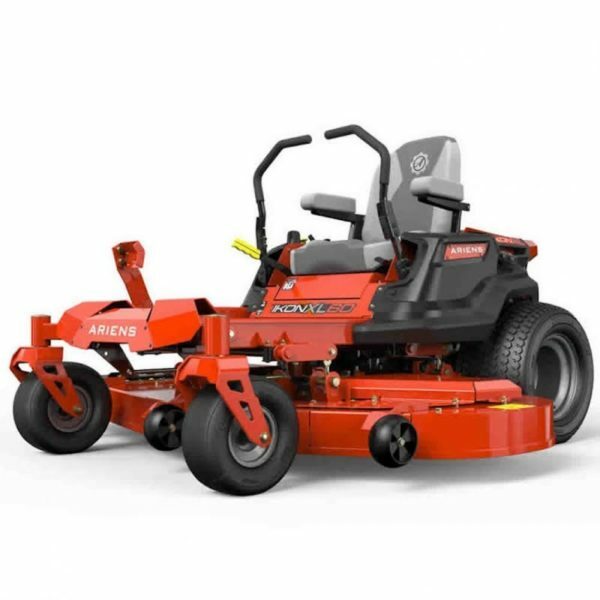 If you have the money and space, you might want to buy the Ariens IKON-XL 60-inch Zero Turn Mower 24hp Kawasaki #915229. It makes quick work of large yards, and it handles easily even for beginners. You just have to get used to steering it with handles instead of a steering wheel. The budget-conscious consumer with a smaller lawn might want to choose the XT1 Enduro Series. We love the way that this one looks, and its durability is even more enticing. Plus, it has a lot of features that make it convenient, such as the QuickAttach system for accessories, and it’s easy to clean. You won’t go wrong with any of these mowers as long as you pick the right one for the job.